But this is 2016, and people are doing something about it. The Twittersphere recently slammed NBC commentators for referring to Olympic female athletes as “girls” instead of “women.” NBC is joined in the hot seat by the official Australian Olympic Team’s Twitter, which used the patronizing term on multiple occasions. And the bill doesn’t stop there. Below are some female Olympians who won’t be stifled by casual discrimination. Making Hicks “the man responsible” for an incident of casual sexism. Some female Olympians face an additional competitor: intersectional discrimination — or the kind of discrimination that affects people who have intersecting identities, such as female and African-American. Olympic swimmer Simone Manuel has won two gold and two silver medals in this year’s Olympics. She recently made history by winning the 100-meter freestyle, becoming the first African-American woman to win an individual Olympic gold medal in swimming. Though it may seem as though her accomplishments warrant name recognition, The San Jose Mercury News thought otherwise when they published an article with the headline “Olympics: Michael Phelps Shares Historic Night With African-American” — a headline which has even more problems than just its casual racism. Chinese diver He Zi earned a silver medal in the women’s three-meter springboard on August 14, though it is safe to say that her massive achievement was hijacked by the arguably more banal “achievement” of being publicly proposed to by her boyfriend and fellow Olympian, Qin Kai. Serena Williams is “the most dominant figure in sports today,” according to Rolling Stone magazine. She’s won four Olympic gold medals to date in tennis singles and doubles. And her sister, Venus, is not one to scoff at either, with four golds under her belt as well. So when British tennis player Andy Murray won his second consecutive gold medal in men’s singles tennis on August 14, he was surprised to hear that BBC presenter John Inverdale had completely forgotten about the Williams sisters. “You’re the first person to ever win two Olympic tennis gold medals. That’s an extraordinary feat, isn’t it?” Inverdale asked Murray. Twitter also replied, jumping down Inverdale’s throat. Some lauded Murray, while others pointed out Inverdale’s other sexist blunders. Some went so far as to demand his resignation, but Inverdale still works for the BBC. John Inverdale "this will be the first Rugby Olympic medal awarded in history..." Apart from the women's event 2 days ago ? Kudos to Murray for his impeccable memory. In what world is a silver medal worth more than a record-breaking gold medal? Ours, apparently. In Rio, swimming powerhouse Katie Ledecky broke her own world record in the 800-meter freestyle, set back in 2012. Her earlier wins in the 200 and 400-meter rallies make her the first woman to seize the gold in all three events since American Debbie Meyer in 1968. But apparently that wasn’t up to scratch for the Greeley Tribune. One commenter fired back at Leong, saying that Phelps’ name would likely garner more interest and sell papers. Another politely advised male dissenters to Google “mansplaining,” then kindly stop doing it. While Phelps is undoubtedly a living legend, having broken a 2,000-year-old record with his 22nd Olympic gold medal, it’s telling that a newspaper — which appears to have course-corrected online — would chose to run a headline about a runner-up rather than a winner. Olympic gold medalist Shawn Johnson has been speaking up about the media’s excessive and disproportionate need to critique female gymnasts’ bodies. She describes being constantly compared to USA gymnast Nastia Liukin. Johnson’s stance is linked to Dove’s #MyBeautyMySay campaign, evidence that, in today’s environment, corporate America is even willing to pay to counter all that awfulness. Controversy, of course, is not limited to female athletes. Enter: Ellen DeGeneres. After the talk-show host posted a photoshopped image of herself riding on Bolt’s back with the caption “This is how I’m running errands from now on. #Rio2016,” the Twittersphere erupted in accusations of racism. “You thought it’d be funny to post a pic of yourself riding on the back of a Black man? Nope. Delete this racist garbage,” user @MikeAllen_47 replied. Has the internet overreacted here? Some think so. “Honestly, there’s nothing offensive in this photo. Its merely a compliment on his speed. Get over yourselves, world,” replied user @vivelagaia. In another instance, male objectification grabbed the spotlight when Cosmopolitan magazine posted a lineup of male Olympian crotch shots. Twitter quickly slammed the women’s magazine, deeming the article sexist and hypocritical. “Double standards are ‘effing horrible,’” tweeted user @o_beswetherick with images of contradicting content. She has a point, but the real question is: Do any of their female readers actually enjoy their gallery of grape smugglers? Read more: How Did Michael Phelps Get Those Scary Bruises on His Skin? 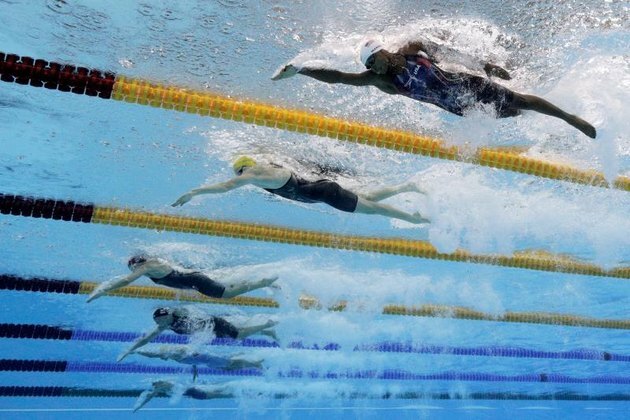 This article was updated on Aug. 16, 2016, to include a section on Katie Ledecky and to note that two photographers had captured versions of the iconic Usain Bolt image. Did you think any of these cringe-worthy moments were casual discrimination when they first happened? What do you think of the social-media uproar? To what extent should comedians practice discretion in order to avoid offending groups of people? Care to share a story about casual discrimination you or a friend might have experienced at the gym or during a sporting event? Tell us in the comments!